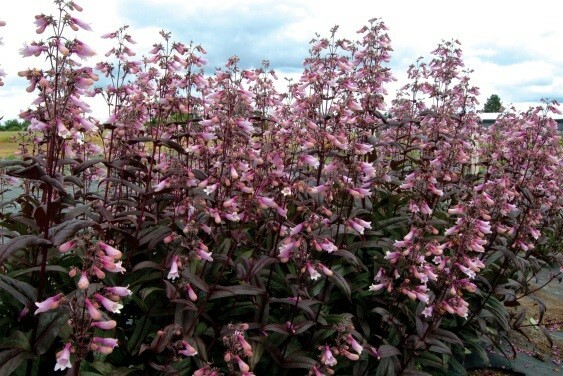 PENSTEMON ‘DARK TOWERS’® a new, proven introduction of Terra Nova® Nurseries, Inc. USA. 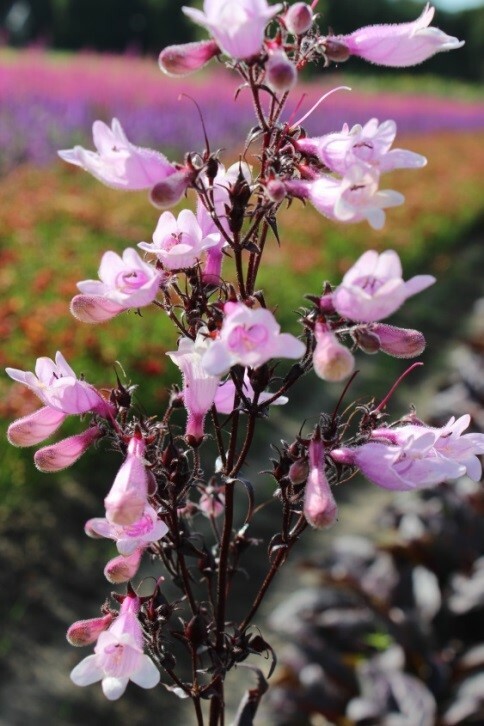 Penstemon ‘Dark Towers’® has been protected by breeder rights in Europe and the USA. Penstemon is a popular and hardy garden plant. Given the proper conditions, it will flourish with little care. 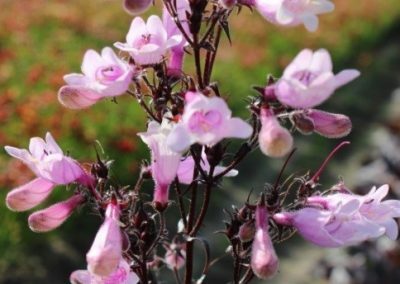 Penstemon now has been placed in the family Plantaginaceae. The common name is foxglove beard-tongue or talus slope penstemon. This early blooming perennial gets its common name from the flower’s resemblance to the foxglove, or digitalis plant. The genus name Penstemon refers to the presence of the fifth stamen that is tipped with a little beard made up of a tuft of hairs. 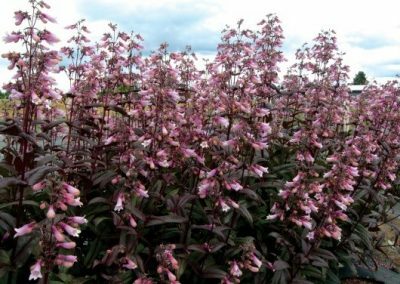 Penstemon ‘Dark Towers’® is a new hybrid cross, made by Dr. Dale Lindgren, a plant breeder at the University of Nebraska-Lincoln and, after being tested for several years, introduced by Terra Nova® Nurseries, Inc. USA. The parents of Penstemon ‘Dark Towers’® are Lindgren’s Penstemon digitalis ‘Husker Red’ and Penstemon ‘Prairie Splendor’ a cross between Penstemon cobaea and Penstemon triflorus. 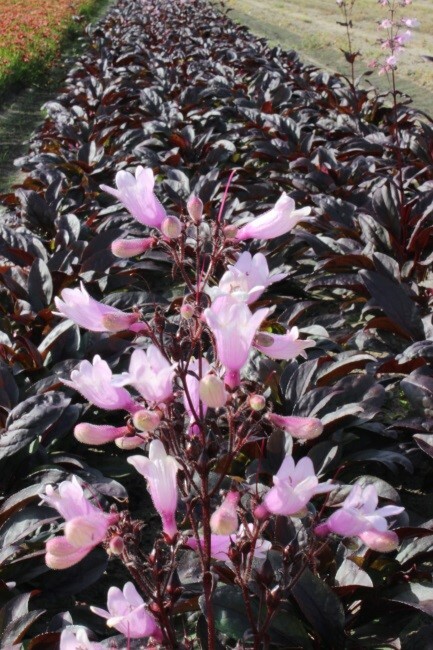 Terra Nova® did further work with this plant to increase vigor and darken the foliage color. Penstemon ‘Dark Towers’® has glossy reddish-purple foliage which is topped with masses of pink flowers in July and August. The reddish-purple foliage and dark purple seed pods contrast sharply with green foliage colours in the garden and landscape. 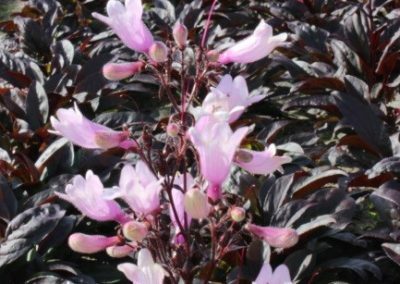 The nearly black foliage is an attractive feature throughout the year and the seed stalks are very useful for flower-arrangers. The pods are dark-purple from August to frost. 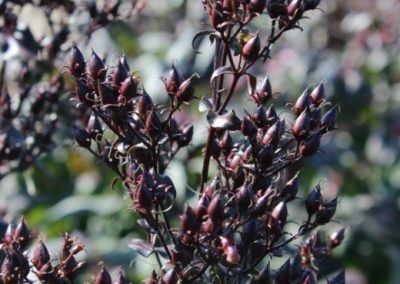 The name ‘Dark Towers’ was selected for both the tall, dark foliage as well as the deep black seed pods that top the plants in summer. Penstemon ‘Dark Towers’® is a tough carefree plant which tolerates high and heat humidity as well as extreme cold. Penstemon ‘Dark Towers’® will replace Penstemon ‘Husker Red’ in the garden, as it stands better in garden situations without staking and it flowers over a longer season. The dark foliage color persists longer than other varieties. 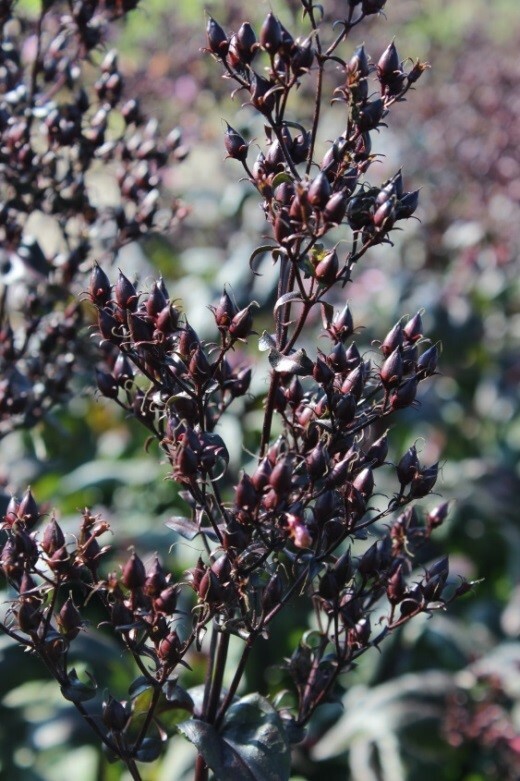 Also, because it is sterile, it does not reseed in the garden, as will happen with Penstemon ‘Husker Red’. 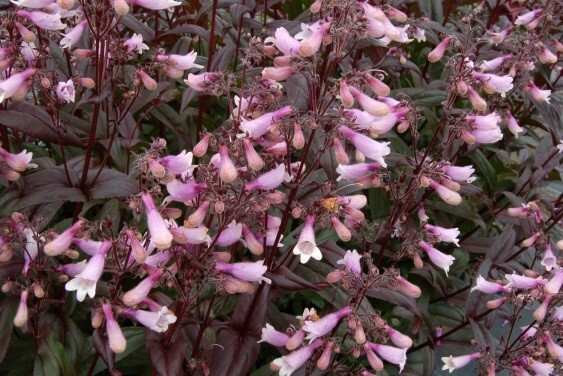 Once established, Penstemon ‘Dark Towers’® has good drought tolerance. Snipping plants back after their first flowering may induce a second bloom cycle. This long-lived plant does well in full sun and partial shade. Penstemon ‘Dark Towers’® carries US patent 20013 and EU patent 27485.